[caption id="" align="alignright" width="380" caption="Enjoy a romantic hot air balloon ride in Northern Virginia."] [/caption] How's this for romantic: gliding over a valley in a hot air balloon with the person you love? The 14th Annual Hot Air Balloon, Wine and Music Festival in the Shenandoah Valley is an ideal destination for folks craving a romantic weekend getaway in VA. Book your Northern Virginia bed and breakfast now for the weekend of October 15 - 17, 2010. The festival takes place in Long Branch, VA, from 1 - 8pm on the 15th, and from 7am to 4pm on the 16th and 17th. Balloonists arrive from all over the country and wineries from all over the state to participate in this fun, colorful event. Friday evening as night falls, fires from hovering hot air balloons will light up hundreds of carved pumpkins, grinning ghoulishly on land. The atmosphere is sure to put everyone in an autumnal frame of mind. On Saturday and Sunday, hot air balloon rides will be available at dawn and dusk, and tethered rides throughout the day. Being in a hot air balloon is like nothing else - it's an ethereal way to travel. Gaze down at trees ablaze in fall color; hover over fields and farmland, and soar over the Rappahannock River. Share this magical experience with the person you love for a truly romantic weekend. Virginia Wine tasting will also be available throughout the weekend. A wide selection of Virginia wineries will be represented, and with the purchase of a tasting glass, visitors may sample as many wines as they like and purchase a bottle to share back at a bed and breakfast Northern Virginia. Enjoy watching colorful balloons floating in the sky while sipping Virginia wine with your sweetie. A selection of locally brewed beer will also be on hand. 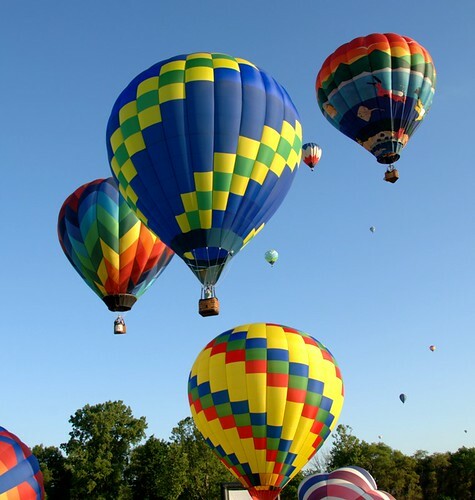 Spend a Romantic Weekend Getaway in VA at the 14th Annual Hot Air Balloon, Wine and Music Festival. In addition to the activities mentioned above, there will be live music, tasty food booths, and a variety of handcrafted items. For more information about the Hot Air Balloon, Wine and Music Festival, please visit their website.